UMX 5/8" Double Attachment Quick Release Universal Link Plain Neck Lanyards - With 14-Colors In Stock. LY-UL-DA-DB plain color double-ends, double hardware attachment lanyards with quick release buckles are great design for a variety of application. You don't need to buy large quantity or pay big money for your small and complex application. We keep large selection of hardware to fit your unique application at your convenient. You can pick same or different hardware at each end. A safety breakaway buckle can be added on the back of neck too. If you are working at labs, airports or hospitals with metal detectors for security check then our non-metal lanyards can save you a lot of trouble. The high quality, heavy duty and non-metal universal link lanyards are designed for comfort to wear with multiple function. Not only designed for scan-safe features but also for those working at wet or salty environment to keep their name badges or ID holders at good shape. We keep large volume of inventory in stock. We can ship your order right away with any custom length! As minimum as 1 piece order are welcome! 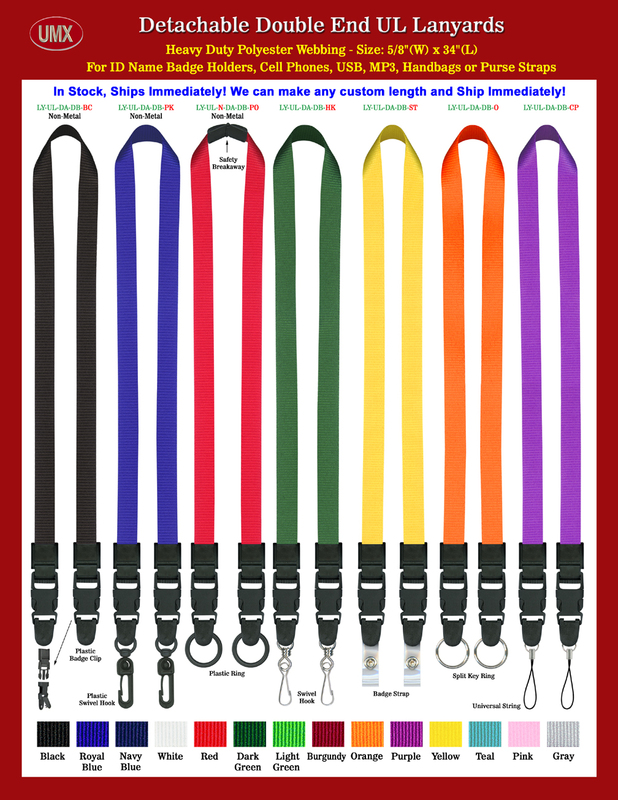 You are viewing Lanyards > Universal Link > 5/8" Double Attachment Quick Release Universal Link Plain Neck Lanyards.